The tall Man, wide chested,with flowing white beard, dressed in white, with broken heart, jeopardizing his sense of Dharma and Adharma standing on the banks of the River Ganga, the only place where he gets comfort, the only place where his unsettled disturbed mind gets soothed and he is calmed down. That is the effect of his mother Ganga has on him, she always comes to her son’s rescue whenever his mind is in a state of chaotic upheaval. To Ganga he was always her son Devavrat and not the mighty Bhisma. If I take my readers long long years back, when Bhisma was still Devavrat, the dazzling handsome youth of great valor, a formidable warrior, the heir apparent to the throne of Hastinapur,his, his father King Shantanu fell in lust with a fisher woman, young enough to be his daughter. 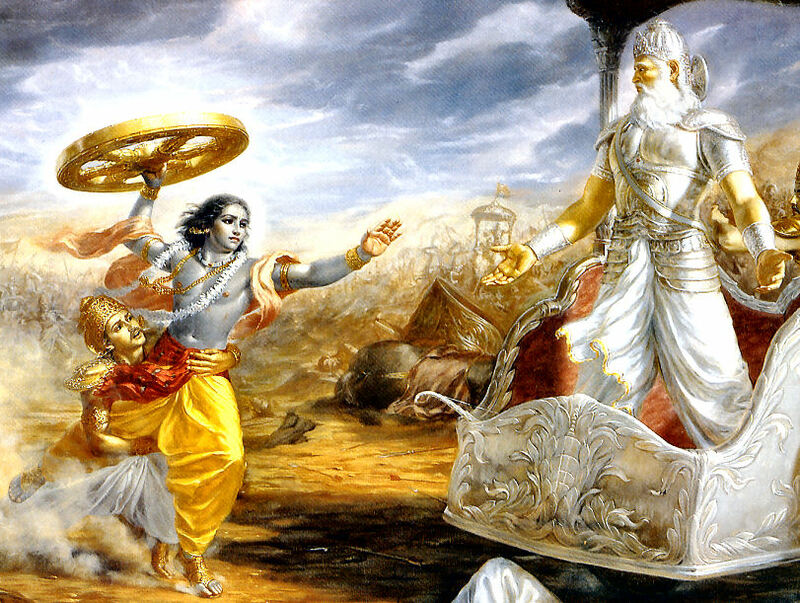 A father became so blind in lust that his young son who had a promising future ahead and under whose leadership the atrocity the Kurukshetra war as witnessed would not have happened at all, had to take an oath of lifelong celibacy. Why??? Just to satisfy the carnal desires or ardor of his aged father? And the father shamelessly agreed to the arrangement? The enigma became a victim first. Why did the young Devavrat take that oath? Just to see his father happy? Is it possible that because of his celestial birth, he was one of the eight Vasus; he knew that he had to take this oath to pave the way for the greatest war? This disciple of Parushuram was so rigid in his oath that no woman could lure him ever. But did Bhisma secretly harbored some soft spot for Amba whom he abducted along with her two other sisters Ambika and Ambalika from Kashi and got them married to his foster brother.Amba was in love with the King of Salva but out of Bhisma’s fear Salva rejected her and she came to Hastinapur, and asked Bhisma to marry her. The staunch patriarch refused but somewhere deep down didn’t he dreamt of having his own family with this fiery beauty who was ready to surrender to his virile self, didn’t he consider just once? Well Mahabharata has no such records, but if we set aside Bhisma’s personality of great reverence, we can think that yes he might have been in two minds; he might have been in love, some great love stories have started with acrid acetous genesis but have emerged into a saga of deep love and affection. Maybe if Bhisma was little more forthcoming then the embryonic state of affection and tenderness laced with adulation could have been reached a different level of mutual admiration. But Bhisma was a victim in the harsh hands of time, he knew he was not allowed to love, he was not allowed to even plant the seeds of desire and emotion in his heart, let alone getting married. He detested Satyavati for urging him to perform NIYOGA with the widowed wives of Bichitravirya. His stern refusal to the world was perceived as his vow of celibacy, but in hindsight can we not conclude the great Man didn’t want to come in any close proximity with any other woman other than Amba? She occupied his mind and heart so monumentally that in the Kurukshetra war, when Bhisma was well aware that Amba’s reincarnated form was Shikhandi who was born to be the cause of his downfall; Bhisma did not deterred from his principle of not using weapon towards a woman. Shikhandi’s male form could not make him forget that the soul thriving inside Shikhandi was that of Amba’s. Bhisma could not hurt Amba, he knew in his heart that he was the cause of Amba’s futile life without the love of the man she desired and later even Bhisma could not offer her that place of respect in his life as his life partner. Bhisma, the man of steely resolve took the penance on himself and accepted the sharp pain of every arrow that was hurled towards him from Shikhandi’s bow. Was that guilt or was that love for the woman he was forced to wrong on the insistence of another powerful woman, Satyavati? When Amba challenged Bhisma that he would have to marry her as Salva had refused to accept her out of his fear for Bhisma, didn’t his heart for a nano second considered the possibility of having someone in his life as strong as beautiful as Amba who would walk in this journey of life with him, sharing the myriad experiences the future had in store for them? We would never know. Bhisma will always be considered and revered as this staunch, firm patriarch of the Kuru dynasty – a robust, indomitable, fierce and fervid celebutante. He will be conceived as a man with a luminary magnetism, a forceful terrific warrior, an all consuming vehement intense protector of his clan, a personification of morality itself, the greatest of the heroes who even forced Lord Krishna to break his vow of not touching any weapon in the Kurukshetra war when the Lord attacked him with the wheel of a chariot, being angered by Arjuna’s charitable attacks towards his grandfather. All these and more tales of Bhisma’s valor will be remembered but the whispers of his beating heart, his helplessness when he was left with no choice other than to take that vow of lifelong celibacy, his inefficacy to even confide to himself that a soft spot was developed for Amba and given a chance his life would not be as lonesome as it was. The enigma that Bhisma was will remain a paradox of mystery but his layers of softness, his desires of affection, his need of companionship will remain under a veil of haze and a stupor of daze, which nobody could penetrate – Bhisma remained a distant figure, revered, respected, worshipped but not loved with that passion- such was his conundrum.